It was a pain to wake up at 4 in the morning just to catch our cheap flight out of Nottingham, UK , via Ryanair; but it was rewarding to see Dublin so empty. As the city was still in its early morning slumber, the first few rays of sun reflected on the bizarre spire-- the Millennium Monument-- in the middle of Dublin’s traffic aorta, O’Connell Street. Yawning workers dusted the shelves of tourist shops lining the street; a few of the cafés already emitted a warm, smoky aroma. Dawn is the only time you can see a city like that. I had debated whether or not I should join my friends from Nottingham as they went to the Guinness Storehouse, a tourist hotspot consisting of a sixteen-euro tour and a free beer (or a 16 euro beer and a free tour, depending upon the way you look at it) -- but my time in Dublin was short. 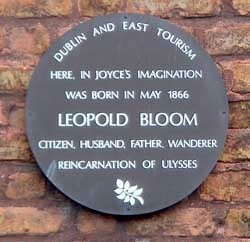 I was there for another reason: to retrace the footsteps of Leopold Bloom. During my semester abroad in Nottingham, UK, I took a class on the Irish author and famous Dubliner, James Joyce. We briefly read Portrait of the Artist as a Young Man to familiarize ourselves with Stephen Dedalus, the protagonist of Portrait and one of the central characters, along with Leopold Bloom, of the gargantuan Ulysses, which we spent the rest of the semester reading. On O’Connell Street, I waited in a Starbucks, a stone’s throw from the River Liffey, for my friend Holly. As the lattes were too expensive – 4 euros or roughly 6 American dollars for a tall– I hid at a table, hoping the barista wouldn’t think me rude for seeking shelter from the wind. Once Holly arrived, along with a Belgian friend named Isa, we started our Odyssey by heading up O’Connell Street in search of a good meal. We strolled into a pub with a sign that boasted “Traditional Irish Food.” When I asked the bartender for a menu, he told me, kindly: “Sorry, love, but we don’t serve food here. Try around the corner.” Apparently the traditional Irish fare is plain and simple: beer and whiskey. We backtracked, traveling farther from the Bloom House, our planned first stop, than I had hoped, settling for a small café. Though it was Saturday and the office was empty, I wondered how funny tourists such as Holly, Isa, and I would have looked to the employees, with our jarring accents, our tennis shoes, our iPhones poised to capture the moment. I’m sure many of the employees would have either gotten a kick out of it, or had worked there for too long to care about it anymore. At the James Joyce Centre, the attendant, a young man, asked us if we would like the student rate. We responded yes, and, instinctively I reached for my wallet so I could produce my student ID. “It’s okay. You don’t need to show me anything,” he said. I was flabbergasted. I told him how kind he was for doing that. I opened my stretched billfold, and I realized that the designated slot for my AAA credit card was empty. I calmed myself from a flash of panic by convincing myself it had probably fallen out in my purse, and handed the young man another credit card that I use at home. After looking around the shop, we reached the staircase; the walls were plastered in wallpaper with Joyce passages in cursive. Holly lent me her cellphone. “Are you sure you took it with you?” my father said over the broken connection. I tried to remember when I last had it. I couldn’t. Like Elizabeth Bishop, I had mastered the Art of Losing, if only by the age of 21. These were normal occurrences, and my father knew this. To assuage me he said he would cancel the credit card, although, a wise man, he did not, sure that I left it in my apartment in Nottingham. Tear-stained and weary-headed, I read through the remaining exhibits: a collection of bedroom furniture, a blur of museum descriptions. The thing that I remember most came towards the end, and this relic is the most peculiar item in the James Joyce Centre-- maybe even one of the most peculiar held in any museum. Joyce’s gaunt face was constructed in plaster-- or, perhaps it would be more appropriate to say that Joyce’s face constructed the plaster. His hair was slicked back, from the looks of the crevices, his famous circular spectacles were absent, and his eyes were closed. The alabaster head floated against the black background, a ghastly sight. I had encountered Joyce in a more physical and intimate way than I had imagined, for this was his death mask. My interest in my surroundings had returned; the credit card fiasco was briefly forgotten. It was true that I couldn’t seem to travel without making mistakes, but why not enjoy the trip? Somehow, I did not miss my flight, I still had money, we had found food in a maze of menu-less pubs, and I had a hostel room to which I could return by the end of the night-- even if I had made a mistake in booking it and was not in the same room with my friends. I returned to Nottingham on Monday morning; I dragged my feet up to my flat, entering my room, dumping my suitcase on the floor, sitting on the bed. As I looked at my desk, something small and blue caught my eye. It was my AAA credit card that, unlike me, had never made it to Ireland.